It’s May 16 and if we were going to see a roll out of Gingerbread to the DROIDX, we probably would have seen some signs from Verizon that it was actually happening. As you may have guessed, we haven’t seen any of them, so we’ll have to assume that it won’t be here today or maybe even this week for that matter. There are a couple of rumors floating around behind the scenes that suggest it may not be out until after the DROIDX2 hits on May 26. And why would they do that? Well, because the DX2 is also looking more and more like it won’t launch with Android 2.3, but 2.2 instead. All of those leaked pictures we’ve seen from the user guide and launch kit with blue Blur are not Gingerbread according to our sources. We were worried that they might slap the new Blur over 2.2 just like we saw on the Bionic at CES and those fears appear to have come true. We’ve been told that the device guide for employees also clearly says “Froyo” and that dev builds of the phone are still running 2.2. Just think, is there any way they would allow the original DX to be running newer software than its replacement? They wouldn’t let it happen. Update: We have pics of an official update here. Need a recap? DROIDX2 launching May 26 with new blue Blur, but only running 2.2. Xperia Play launching May 26 with stock Gingerbread. 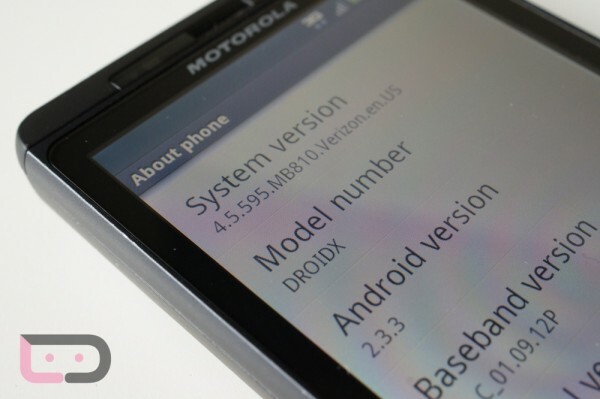 Original DROIDX won’t receive Android 2.3 until the DX2 has it. Hopefully that didn’t ruin too many Mondays, but we wanted to keep you in the loop on what we’re hearing. If things change, we’ll be sure to let you know.